 Gold chain-link panels enclosing all 4 quadrants of Mount Vernon Park.  Fence panels are rented from a construction rental company. Each panels stands 7 ' tall x 12 ' long.  No footings/anchors are required; having no permanent impact on the park.  16 plaques, approximately 2 ' x 1 ', centered on each side of the four squares explain the park's temporary change.  Fence sits on street level along the length of the parks. 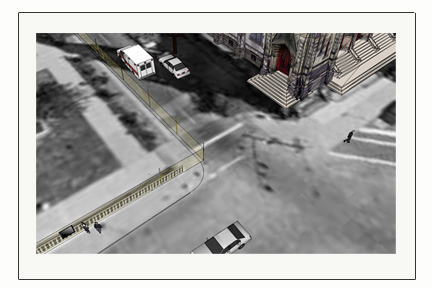 At either ends of all four parks the fence runs along the outside edge of the existing permanent barriers or boundaries - leaving the sidewalks exposed at the intersections.  The fence is locked for 2 weeks after the opening of MAPS: Finding Our Place in the World at the The Walter's Art Museum, mapping the space in an atypical manner.  Panels unassembled and stacked horizontally in each square by a group of volunteers celebrating the re-vealing of the park as a product of an exciting art exhibition.  Panels are removed from the site March 31, 2008.